A few weeks ago I shared a list of great gifts for someone who is just starting to try projects themselves (You can find the post HERE.) …but if you need a gift for someone who has been doing projects for a while, then I have a few items that I love and I’m sure they will too. All of these items are useful for many different types of projects and while a few are pricey, I have two that are very affordable. This saw is the most versatile type of miter saw. It’s ability to slide back and forth on rails allows you to cut wider stock with a smaller blade, something that’s impossible with a conventional miter saw. This is a tool I wanted for a while but was afraid I wouldn’t use enough to justify the price…I WAS WRONG! I use this tool all the time because it’s so convenient. The battery makes it portable and you can change out the nails easily to fit the project you are working on. This saw is much better than a circular saw for ripping material (cutting it to width along the board’s length) and for trimming small pieces. They can crosscut, rip, miter, and bevel. The best part is you can see what you’re doing because it’s stationary while you feed it the wood. This is great when you need an extra hand for moving sheets of plywood across the bench to the saw and for stabilizing longer pieces of wood when you use a miter or table saw. I work on projects by myself often and I couldn’t get by without a roller stand! A stud finder helps you find the wood studs behind your drywall, so that you can secure large or heavy objects to the walls. If you have one with a laser level it serves two purposes! I use this tool often for projects like these: stripes and adding height to a ceiling. 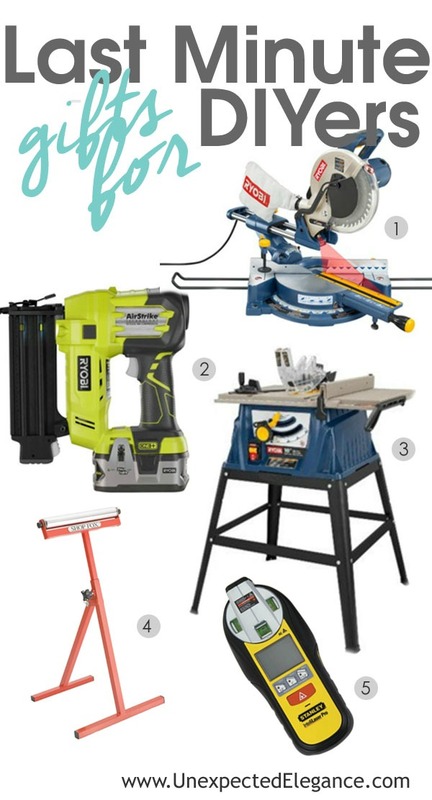 Do you have a tool you just can’t live without that’s not on this list or my beginner’s gift guide? I’d love to know what tools you use the most!